Graham Savill, Bowie Fan and London Theatre Director. Available as a 5-piece full band or as Bowie Solo. Musically and visually, Absolute Bowie faithfully and accurately take you on a journey through the ever changing phases of Bowie, from A to Z (Absolute Beginners to Ziggy!) with Stations to Station in between. 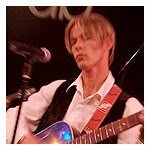 All the classics, Space Oddity, Heroes, Ashes to Ashes, Life on Mars, PLUS a few very cool surprises too!